The My Plate, My Planet ad in the New York Times on March 24, 2015. Here are the comments Brighter Green submitted to the U.S. Departments of Agriculture (USDA) and Health and Human Services (HHS) in May 2015 in support of including sustainability criteria in the revised “Dietary Guidelines for Americans.” The Guidelines help determine U.S. national nutrition policies and food procurement (purchasing) programs. This year, for the first time, the Dietary Guidelines Advisory Committee (DGAC), the independent scientific body that advises the USDA and HHS, recommended adoption of sustainability considerations in the 2015 edition of the Guidelines. You can read all of the more than 24,000 comments submitted to USDA and HHS—a record—here: In addition to the comments, more then 200,000 people signed petitions supporting inclusion of sustainability in the Guidelines. 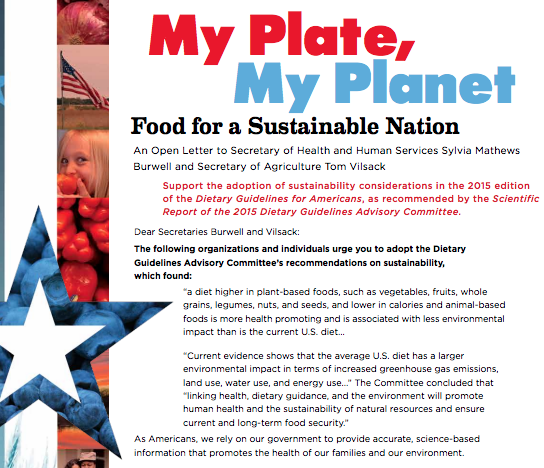 Please see My Plate, My Planet: for more on the sustainability language and what’s at stake as the Guidelines are revised. On behalf of Brighter Green, a public policy action tank based in New York that works at the intersection of issues related to the environment, animals and global development, I write to strongly support the scientific report of the 2015 dietary guidelines advisory committee, and specifically the sustainability language it contains. A growing cadre of scientists and policy makers, and Brighter Green’s own research, conclude that the public health and environmental impacts of food production and consumption are closely linked and, as such, require integrated policy responses. Addressing this reality will require greater public education about the impacts of food systems and dietary patterns, including on water, land, biodiversity, greenhouse gas emissions, animal welfare, and overall prospects for sustainability and food security. It will also require public policy changes to bring about more sustainable, equitable food systems and dietary patterns, and in this, the leadership of government agencies and experts will be essential. The committee’s recommendations for the U.S. dietary guidelines are an important element in this process in that they will inform the public about healthier ways of eating, using strong science-based criteria, and help shape the buying and procurement practices of institutions across the U.S.
At the same time, they offer a scientific rationale for Americans to eat less meat and more plant-based foods for their own health and for the well-being and resilience of the natural world—a consensus position that most public health and environmental experts have reached, not only in the U.S. but also globally. Current dietary and food production patterns in the U.S. exert heavy costs on ecosystems. They also rely on enormous externalities, such as water and air pollution, topsoil loss and contamination, and the crowding out of more diverse, resilient agriculture in favor of heavily subsidized monocultures of feed crops and domesticated animals; a vast majority of these animals are confined in the highly unnatural and patently cruel environments of factory farms and feedlots. Surely this system will have to change, particularly with the added challenges of climate change (please see: here; also attached). We also know that the way a majority of Americans eat is linked directly to an array of non-communicable diseases (NCDs) like overweight and obesity, some cancers, and diabetes, and that food insecurity is a reality for millions of people in the U.S. It’s crucial that the U.S. national dietary guidelines reflect both of these realities and offer Americans a way of addressing them in their own lives and within the institutions that shape those lives. We also support the committee’s recommendations given the dietary guidelines’ potential impacts beyond the U.S. Much of Brighter Green’s research is focused on countries of the global south and the impacts there of rapidly changing food patterns and food production systems—and the resulting environmental, equity, animal welfare, and public health impacts. Countries in Asia, Latin America and Africa are adopting U.S.-style diets that are high in meat, other animal products, sugars and processed foods, along with U.S.-style industrialized animal agriculture and large-scale production or import of feed crops. This is a pattern rife with myriad negative consequences, including rising rates of NCDs and increased pressure on land, forests and water. Our work and that of an increasing number of researchers judge this phenomenon to be unsustainable and unwise. Other models are essential, and the U.S. setting a new, better example could lead to urgently needed changes in the troubling current global trajectory of food production and consumption. The dietary guidelines can be an example to and a resource for governments, institutions, non-governmental organizations, and individuals in other parts of the world. We realize this is not the guidelines’ primary purpose. Nonetheless, it is an additional practical and potentially far-reaching benefit. This gives even more weight to our strong recommendation that the USDA and HHS adopt the committee’s recommendations on health and sustainability, and ensure their inclusion in the final text of the 2015 revision of the Dietary Guidelines for Americans.